Be live Family Costa Los Gigantes is set in Tenerife?s Santiago del Teide. This luxury complex has a spa, tennis courts and 6 heated outdoor swimming pools. The hotel has wonderful views of the Atlantic Ocean and the island of La Gomera. The impressive Los Gigantes Cliffs are less than 1km away. The Be live family Costa Los Gigantes has a garden and terrace with sunbeds. There is also a kids? club, a large games area and a cinema. Free Wi-Fi is available in the main building. The hotel?s thalassotherapy spa has an indoor pool, steam bath and hot tub. It also features a relaxing area, ice fountain, floating pool and a sauna. There is also a fitness centre and various beauty and massage treatments are offered. The hotel offers spacious suites, all with a private balcony or terrace. All rooms are air-conditioned, and have a living area with a flat-screen TV, mini bar and private bathroom. 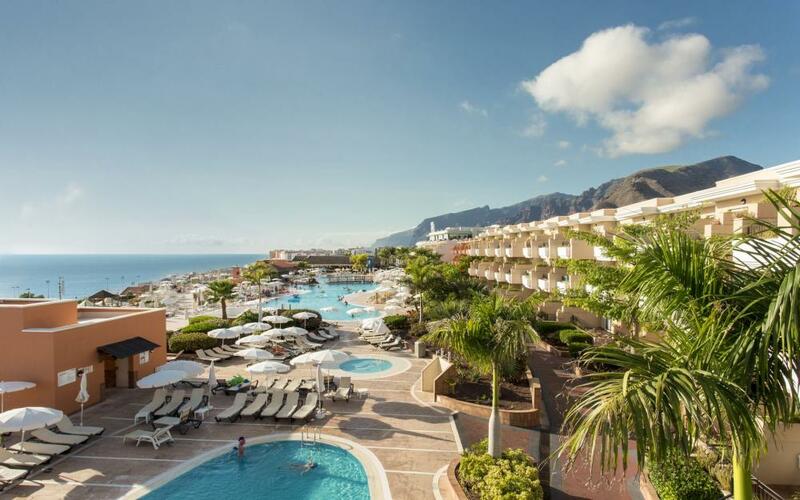 The hotel is located in the municipality of Santiago del Teide, only 5 minutes from the village Playa La Arena, 500 m with excellent changing facilities and showers. On the beach, you will also find a wide variety of bars and restaurants as well as facilities for water sports. The beach is controlled by a security guard throughout the day. The resort offers an all-inclusive. Enjoy the excellent cuisine of the Hotel in one of the 2 restaurants and 3 specialty dinners (for a week´s stay, reservations required), as well as snacks served in the snack-bar from 10:00 to 18:00. Alcoholic beverages, soft drinks, water, beer and wine may be tasted in restaurants and bars in the complex. For kids, a theatre designed especially for children, babysitting service (additional charge), special buffet, entertainment centre, mini club. The complex has 518 suites and rooms, 481 junior suites, standard type (there are rooms partially adapted for disabled, on request),and 37 double rooms. The double rooms feature separate bedroom with choice of king size bed or two twin beds, bathroom and flat screen LCD TV 32 “with Satellite. Standard Suites offer separate lounge with sofa bed and 2 flat screen LCD TV of 32 ". I would recommend hotel for the families with younger kids but not for adults. Management should seriously consider their wifi and coffee policy. Great place for younger kids. Its clean and nice and friendly service. Good variety of food. Beds could be better. Worst part of service was wifi. At first it should be included in all inclusive packages. We were able to by internet only for 1 device for family of 4!!! its crazy. Internet was very slow and we cancelled subion. Wine was also pretty poor. We expected that spanish wines are better. Alcohol selection was one of the poorest in all inclusive hotels. No coffee during lunch and dinner! Coffee was also pretty bad. For a normal coffee we had to pay and bar stared to sell it only at 10!!!. Fantastic hotel and facilities, everything was spotless and in a very good condition. It was great that everybody spoke english and even a lot of the entertainment programme was aimed at english speaking guests. The kids had a great time and plenty of activities to keep them busy, a big thanks to the mini-club team. Would definitely recommend it and go back myself. Lo mejor las instalaciones exteriores, lo peor comida correcta pero repetitiva y la limpieza floja.